[vc_row][vc_column][vc_column_text] Come hang out and hang ten with friends! 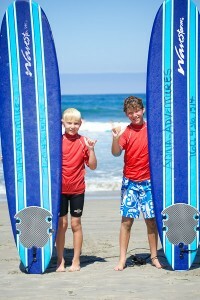 This rad camp includes surf, paddle board, surf kayak, and snorkel activities. For students ages 13 through 16 years old, Teen Ocean X-Cursion Camp includes three days of surfing instruction at 15ths St./Del Mar, one day of paddle boarding and surf kayaking at Cardiff State beach, and one day of snorkeling at La Jolla Cove. Campers will improve surf skills, body boarding, and beach games and will have an opportunity to spend some time with peers as they get to experience other exciting ocean activities that our marvelous Pacific Ocean has to offer. This is a socially safe environment where young adults can keep active, try some new activities or enjoy the activities they have done before.